Podstrana is a small tourist settlement located only 8 km south from Split. It is a true getaway destination for those who want to run away from the crowded streets and still be close to all the perks of the big city. With its untouched natural beauty, unpolluted blue sea, mild climate and elite accommodation, Podstrana is a true paradise on Earth. It is often considered as an elite Split suburbs. Apart from being a desirable tourist destination, Podstrana is also famous for its agriculture. You can see picturesque patches of vineyards and olive tree plantations on the slopes of the Perun Hill overlooking the settlement. Wines, olive oil and peaches from Podstrana are among the best in Dalmatia. Although Podstrana is a small settlement, it has a long history and a rich cultural heritage. There are archaeological findings implying that the area was first inhabited by the Illyrians several centuries before Christ. There are remnants of the numerous rustic villas and summerhouses from ancient Roman period and from the renaissance. Those historic sights are essential to visit if you are interested to learn more about the history of Podstrana. Once you reach Split, it is very easy to come to Podstrana. Since it is only 6 km away from the city, there are regular bus lines driving to and from Split. The bus fee is between 2 and 3 euros. 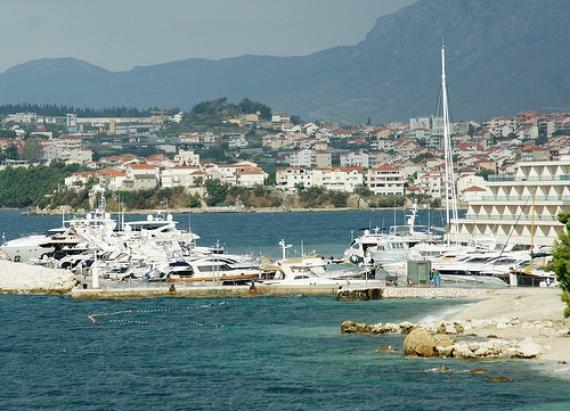 Podstrana is just a few kilometers away from the airport, bus, train and ferry terminals. There are over 2500 accommodation facilities in Podstrana, ranging from private apartments and rooms to five star hotels. The prices of private accommodation can range between 30 and 170 euros. The majority of those apartments are in the immediate proximity to the sea. The most popular and beloved hotel in the area is Le Meridien Lav, a luxury five-star resort. With its beach front location and panoramic view, a wide range of services and beautifully decorated spaces, this hotel is among the most popular resorts in Croatia. Podstrana is a small maritime town mostly offering low key evening entertainment. After the daytime refreshment by the sea, you should head towards some of the famous local restaurants and enjoy some of the freshly prepared fish and seafood specialties. Restaurants Amigos, Arkada and Jure are among the praised eating venues. If you wish to prolong your night time entertainment, you can visit M-Caffe, the local nightclub and enjoy the dancing rhythms until the sunrise. And for a more diverse nightlife offer, Split is just a few miles away. Find information about selected Hotels, apartments and rooms in Podstrana to choose the perfect place for your accommodation.